Aston Villa boss Paul Lambert has rejected claims contract negotiations have not started with Ron Vlaar and expressed a desire to keep his captain. Vlaar, 29, is out of contract next summer and the defender has been linked with a move to Manchester United. "We have been speaking with Ron and the message from his agent was thanks but no thanks," said Lambert, 45. Vlaar joined Villa for £3.2m from Dutch side Feyenoord in 2012 but could leave for free in June 2015 if a deal is not agreed. "Even though Villa chief executive Tom Fox made it clear Vlaar wouldn't be sold in January, Lambert is a realist. He wants him to stay but at 29 Vlaar will be eyeing one more lucrative move. "There have been no bids for him since the World Cup and Lambert hopes the player, now he is aware of the situation this week, will be having a word or two with his agent and will try to start meaningful negotiations. But if Vlaar continues to listen to his agent, I think he will be off next summer." His agent, Arnold Oosterveer, last week fuelled talk of a move away from the Midlands club, citing the contract's end offered a "natural break" and a "nice step" for his "ambitious" client. 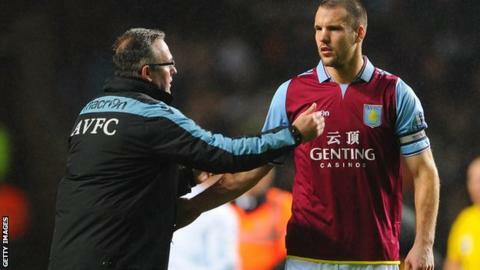 A calf injury in September has restricted Vlaar's playing time at Villa to just seven games this season but Lambert is adamant he wants Vlaar to stay and is frustrated with Oosterveer's comments. Speaking to BBC Radio 5 live, Lambert said: "I'm not blaming Ron in any shape or form. He's been great, (we've had) good dialogue with him but I don't think you can do what he (Oosterveer) did. "The options are open for Ron because he's in his last year, but I don't think you should air your views... especially when they're not true. All you can do is your best to try and keep him. We are trying our best on that front." Rumours of a move to Manchester United - managed by Vlaar's former Dutch national manager Louis van Gaal - have existed since the World Cup, where the centre-back made seven appearances.